KnitPro Symfonie Wood Interchangeable Deluxe Knitting Needle Set.<br> <br> Includes a free set of cable connectors.<br> <br> 8 Knitting needle Tips.<br> <br> 3.55mm (US4), 4MM (US6), 4.5MM (US7), 5MM (US8), 5.5MM (US9) 6MM (US10), 7MM (US103/4), 8MM (US11.<br> <br> 4 Cables, 60cm (24), 80cm (32) 2Nos, 100cm (40).<br> <br> Accessories 8 Cable end caps, 4 Cable keys, 1 Cable case, 1 Needle case. 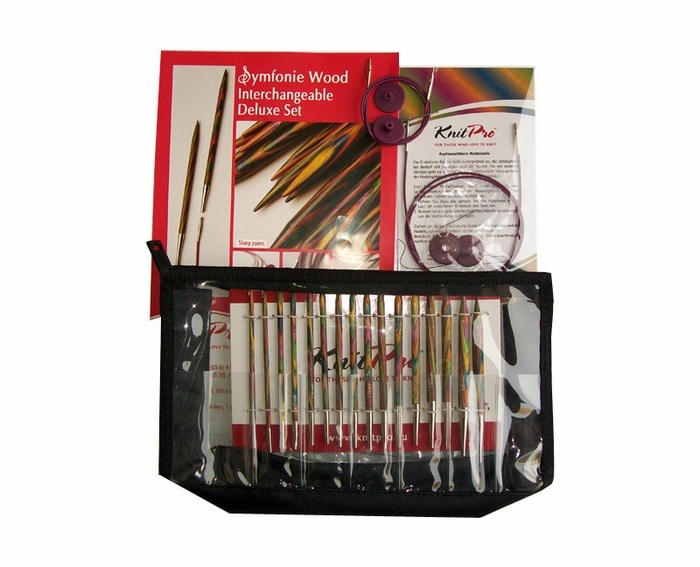 KnitPro Symfonie Wood Interchangeable Deluxe Knitting Needle Set. Includes a free set of cable connectors. 3.55mm (US4), 4MM (US6), 4.5MM (US7), 5MM (US8), 5.5MM (US9) 6MM (US10), 7MM (US103/4), 8MM (US11. 4 Cables, 60cm (24), 80cm (32) 2Nos, 100cm (40). Accessories 8 Cable end caps, 4 Cable keys, 1 Cable case, 1 Needle case.